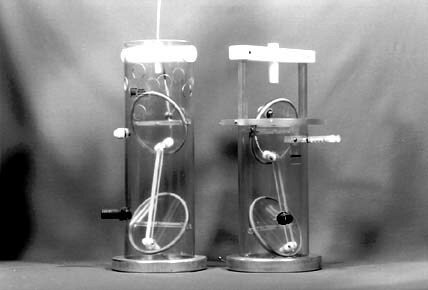 The Haney Grazing Chamber (Haney;1971) was developed to gently trap zooplankton while automatically exposing the enclosed assemblage to trace amounts of radio-labelled food particles. Isolated in-situ, the animals are allowed to feed on the suspension for a short period. Upon retrieval, the sample is filtered and zooplankton are assayed for ingested particles. High sensitivity, simple measurements and naturalness of conditions are offered by this well known experimental technique. A characteristic design feature of the grazing chamber are rotational polycarbonate lids within a clear polycarbonate tube, similar to a "butterfly-valve", where integral silicone "O" rings seal against the cylinder wall in horizontal and watertight position. Pivotal lids, articulated by a Delrin® linkage, are held in the "open" position by a messenger release mechanism during deployment. As a messenger strikes the release mechanism, gravity pulls the weighted (by stainless steel tube) cylinder downward while the lids rotate to the horizontal (closed) position. Immediately, as the lids of the chamber close, the piston is forcefully ejected to release labeled particles into the chamber. Using the key innovative design features of the original sampler, the ARI/Haney Grazing Chamber is a simplified version of the original design constructed using advanced plastics.